We are long overdue for an Old Forester bourbon review. (That was a rhyme right there. See what I did?) Old Forrester comes from one of the best distilleries in Louisville, and has been on the market for 145 years as of 2016. That makes Old Forrester the longest running bourbon on the market. The Old Forester brand was the creation of a business man named George Garvin Brown. Brown decided to start a whisky business with his half-brother, J.T.S. Brown, Jr., who was already in the whisky business, in 1870. Together they would purchase whisky from a distillery, batch it together, and bottle it. That would ensure anyone purchasing their product could expect safety and consistency. His signature was on the bottle as a guarantee to his customers. It’s worth noting that George Garvin Brown had the idea for consumer protections long before the Bottled in Bond Act passed in 1897. This led the way into the modern era of whisky production, and once patents were granted for two piece machine blown glass bottles in 1887 and three piece machine blown glass bottles in 1893, whisky became closer to the modern product we now know. Brown-Forman was one of 6 Kentucky distilleries allowed to remain open during Prohibition. Today, Old Forester is the only bourbon distilled, aged, and bottled entirely in Louisville. Fun Fact: George Gavin Brown actually invented the concept of branding. He would “brand” his barrel heads to let customers know they were getting the real deal. A concept that has stuck with retailers ever since. The Brown-Forman distillery is still run by his descendants to this day, and they are doing pretty well for themselves. Brown-Forman is now one of the largest American-owned companies in the wine and spirits business. Each year around September 2nd, Brown Forman Distillery releases an Old Forester Birthday Bourbon to celebrate George Garvin Brown’s birthday. People go absolutely insane over these limited releases – lines form, fists fly, lottery tickets are handed out for a chance just to buy a bottle. Every year, Brown Forman releases an Old Forester Birthday Bourbon in September. No two birthday bottle years are the same (the bottles sport a vintage date, and can be between 8 and 12 years old) and some bottles are coveted more than others. But I digress – we are here to talk about the cheap stuff. There are actually quite a few different versions of Old Forester bourbon, including bottled in bond, single barrel, and prohibition style. Those reviews are on the way, and we will link to them from this article once they are ready. This review covers the 86 proof straight bourbon whiskey. 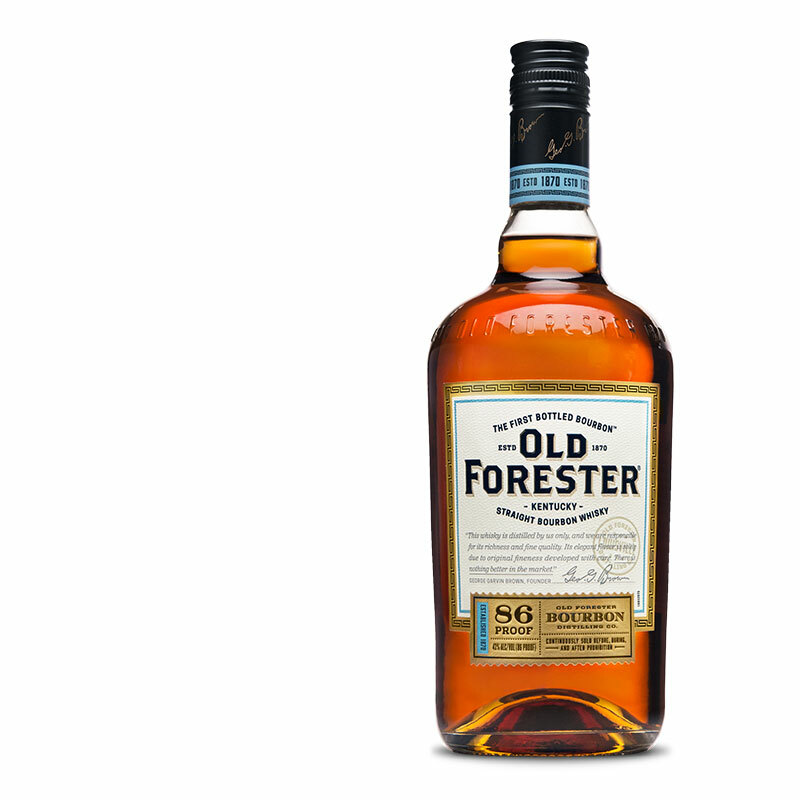 Old Forester bourbon isn’t a knock-your-socks-off whiskey. It it what it is. Straight forward, middle of the road, and predictable. Exactly what you would expect from a $15 bottle of bourbon. The mash bill is the same as Woodford Reserve – 72% corn, 18% rye, and 10% malted barley. You can definitely pick up on the corn on the nose. The predictable char is there, as is orange peel and vanilla. There is nothing remarkable about the nose except its fullness. Coming from an 86 proof whiskey, I expected a lighter nose. There is also a surprisingly notable floral fragrance that adds an interesting dynamic to the whiskey. The first sip is middle of the road. No burn, light flavors of candy corn and baking spices, but it all evaporates fairly quickly. The aftertaste is light and fruity – pears and honeydew. I did this tasting with a few ice cubes, and it killed the bourbon. I would go so far as to say either try this bourbon neat or go all the way and use it as a mixer. Old Forester is a popular well bourbon in Kentucky. Not bad enough to be called swill, but not good enough to be put up on a shelf. This is a great party bourbon, or a sipper to give to bourbon newbies. But if you are an experienced drinker, I would reach for Woodford Reserve before Old Forester 86. This is a good, cheap bourbon. No doubt about that. Drink it neat, put some ginger ale in there, or do a splash. It will get you to where you need to be. Learn our process for how we grade bourbons. If you disagree, leave a comment below. But for the price, Old Forester is a solid crowd pleaser. If you cant find it in your area, you can have it delivered to your doorstep or office. I’ve been drinking Old Forrester for over 40 years- if I want to taste leather or toffee, I’ll chew on an old belt or eat a Snickers bar/ but, if I want an old-fashioned Bourbon I’ll drink an Old Forresters! and Birthday if you’ve had it. Great suggestions, and I am more than happy to get back to the bar to review these. Cheers!